The Online Home Of Randolph Lalonde: Savage Stars and Spinward Fringe Continue! Savage Stars and Spinward Fringe Continue! Savage Stars is approaching 40 chapters, which means that it's about 10 chapters away from being its own EBook! For everyone who is loving the serial on Patreon, you'll be happy to know that it'll continue on past chapter 50, into a new trilogy of Chaos Core books yet to be named. 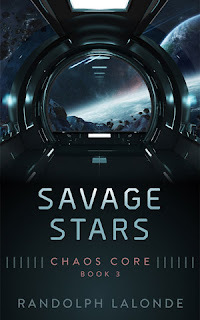 It'll be a serial first, then released as Ebooks as they grow to that size and finish big chunks of the story I have planned for a trilogy that focuses on swashbuckling space opera more than Savage Stars has so far. Today, chapter 38 is out for subscribers! Chapter 20 is free for all!